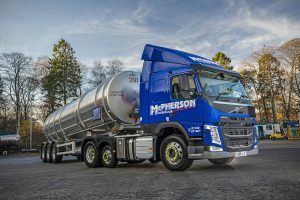 McPherson of Aberlour, the well-known Scottish logistics providers and long- established Volvo Trucks customer, has taken delivery of the UK’s first Volvo FM LNG tractor units, both of which are ADR specified for transporting distillery by-products to Scotland’s Central Belt. Supplied by Volvo Truck and Bus Centre North & Scotland, the 6×2 pusher axle Lite tractor units are powered by Volvo’s G13C engines, which drive I-Shift automated 12-speed gearboxes. The FM Sleeper Cabs are equipped with full aerodynamic kits. “Both FM LNGs are covered by a four-year Volvo Service contract, which will be carried out at either the Aberdeen or Inverness dealerpoints,” Martin added.